Reading inforum.com, you learn something new every day. For example, today we learned that in addition to Rob Port, there is someone named Ron Port who blogs for the Forum Communications Company. 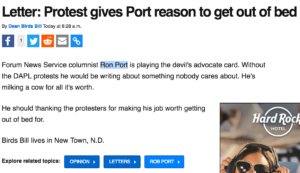 “Forum News Service columnist Ron Port is playing the devil’s advocate card. Without the DAPL protests he would be writing about something nobody cares about. He’s milking a cow for all it’s worth. This fascinating, albeit grammatically incorrect and misspelled letter, is why we get out of bed in the morning. Be the first to comment on "“Ron” Port Loves to Milk Cows"